Thank you, The Mindful Expat for nominating me for the Liebster Blog Award! I’m fairly new to the Land of Blog and I’m honored to be recognized and Libstered! I’ve been following The Mindful Expat for some time now and I enjoy her personable, insightful posts. She’s an American psychologist living in Lyon, France with her engineer Frenchman. To spark some conversation about cultural differences, self-awareness and mindful living, she writes about international adventures and her inner and outer journey. Her site includes Resources for; expats, out and about in Lyon, and Mindfulness. The Liebster Blog Award is given to up and coming bloggers who have less than 200 followers. So, what is a Liebster? The meaning: Liebster is German and means sweetest, kindest, nicest, dearest, beloved, lovely, kind, pleasant, valued, cute, endearing, and welcome. Blogging is about building a community and it’s a great way to connect with other bloggers and help spread the word about newer bloggers/blogs. 1. Thank the person who nominated you for the Liebster Award and link their blog to your post. 2. Answer the 11 questions they’ve asked you. 3. Nominate 11 bloggers who have 200 followers or fewer for the award. 4. Ask 11 questions to your nominees. 5. Let your nominees know you nominated them once you’ve posted about your Liebster Award. 6. Add the Liebster Award badge to your blog! Question created by The Mindful Expat for me, and my answers! 1. What inspired you to start your blog? And if it’s not totally obvious, how did you come up with the name for your blog. I wanted to write about two books, Before Sundown everyday, and Happily Ever After. The blog expanded into other categories, Featured Friends, Family & Friends Photo Gallery and other fun things. The title of the blog is pretty obvious, Before Sundown, with a different tagline, remember what made you smile. Overtime I was inspired by blogger friends’ (Ellen Hawley, Notes from the U.K.,& Maggie Wilson, Zombies Ate My Brains) mastery of humor in writing to try some of my own. It worked! I started writing right to the “edge.” The Mindful Expat described my site as the eclectic and whimsical blog of a retired nurse practitioner turned writer! Yay!!! A sprinkle of magical fairy dust for The Mindful Expat! Do real people in your life know about your blog (and read it), or do you keep it anonymous? Yes, real people in my life know about and read my blog, especially when they are featured. 3. If someone were to make a movie of your life, what actress would you want to play you? 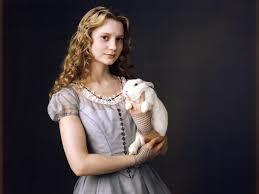 Mia Wasikowska (Alice in Wonderland). 4. What genre would best characterize your movie? Fantasy Fiction. A big step up from a whimsical fairyland and magical fairy dust! On second thought, I need to grow up and get out of fairyland sometime. So, #3 would be Kate Beckinsale! 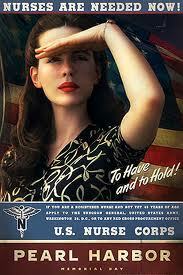 (Pearl Harbor). It’s obvious! #4 would be Epic War Movie with action, drama and romance! Even though I loved little, white rabbits and all animals as a kid! 5. What’s one item on your bucket list that you hope to accomplish in the next few years?Publish those two books! Before Sundown everyday and Happily Ever After! 6. If you came back in another life as a (non-human) animal, which one would you want to be? A dog! German shepherd or Husky. Or maybe a wolf. 7. What languages can you speak? English, Italian, and very rudimentary Japanese and Greek (with a lot of help). 8. What’s your favorite food that you discovered as an adult? There’s nothing in the food category. How about a beverage? Starbuck’s Mocha Frappuccino! 9. Name one thing you’re grateful for? Today! There’s no guaranteed tomorrow! 10. Name one great book you’ve read (relatively recently) that you’d like to recommend to others (i.e., me). The Giver by Lois Lowry (winner of the 1994 Newberry Medal). Balancing the values of freedom and security. 11. Do you listen to podcasts? If so, tell us one of your favorites. No, not listening yet. HERE ARE MY OWN ELEVEN (11) LIEBSTER BLOG AWARD NOMINEES! Beforehand, I apologize to any nominee with over 200 followers. On some blog sites, it’s hard to figure out numbers. I’ve tried to recognize new bloggers and some more advanced that have amazing blog sites. Visit them and you’ll see what I mean! Of course, there were some really awesome bloggers that have hundreds of followers and don’t qualify! Of course, some of you are busy bloggers and may not want to accept this award nomination. I do understand, and I’ll still follow you! I thank you and I’m grateful that you’re following my blog. I’ll let you know about your nomination in a comment on your site. It will take me a little time, so don’t be shocked, be happy, if you get this post beforehand! 1. Where do you live? Why do you live there? 2. What is your favorite season of the year? 3. What have you learned about yourself recently? 4. Describe a happy memory from your childhood. 5. What is the best book you’ve read recently? 6. If someone were to make a movie of your life, what actress would you want to play you? What genre would best characterize your movie? (Of course it’s a repeat favorite question). 7. If you could live in another time, what time would that be? 8. If you could be an animal, what animal would that be and why? 9. Why did you decide to start blogging? 10. Where do you find inspiration for what you write? 11. What is your blog theme (or more than one), stories, photography, books or poems? Why did you choose that blog title? This entry was posted in Awards, My Blog, My Entries and tagged Ask nominees 11 questions, Before Sundown nominated, Great Community, Liebster Blog Award, Nominate 11 more, Rules and Questions, The Land of Blog, The Mindful Expat nominated me, up and coming blogger. Bookmark the permalink. Congratulations !!! I’m so glad I found you on this long and winding blog road, and you put so much effort into acccepting your lovely award. I love Maggie and Ellen, and I also read Almost Iowa. I’d say I love him but don’t want to start a scandal 😊. His comments are as witty as his posts. Will certainly visit your other nominees. Keep up the enthusiasm for this delicious pasttime and best wishes with your books! Me too, Sammy D. We do have blogger friends in common! I kinda like Almost Iowa too! Well, I had you on the nominee list until I checked on your site for follower numbers! You are close to 300 now and not in the up and coming category! I felt really awful! But happy for you that you’re in the already made it blogger category! I love reading your posts! 😊 thanks for thinking of me. I’m fortunate my lovely readers have nominated me for awards, which helped get me more readers! Now I appreciate other good bloggers being recognized. Thank you mindfulexpat! For the nomination and for the great questions! There are some up and coming bloggers nominated that have wonderful blog sites. Thanks so much, Masgautsen! I’m going to write you a personal message on your blog site. You noticed? I nominated you for the Liebster Blog Award. You’re # 1 on the nominee list! The message is on your blog site! Hope you can find it. If not come back here and you’ll find out what it means and what the rules are! J.Gi, I’ve read other rules on the Liebster Award and one said 1,000 followers or less, which is hard to believe if you’re an up and coming, new blogger. But, I wouldn’t worry about nominating someone with more. It’s already done and the nominee was no doubt happy getting it. I think I nominated someone with more too! And I told her to please just accept it! I missed seeing her numbers! There are other awards that don’t have any rule on followers, like the One Lovely Blog Award. Thank you for the congrats! I like reading your posts! Congrats on the Liebster, Christine, and thank you for nominating such interesting bloggers. You have exquisite taste. I’ve been exploring. Thanks so much for your congrats and comment! Yes, they are interesting new bloggers! I’m glad they’re in the Land of Blog community now! 1. Where do you live? Why do you live there? I live in Oregon state. I was born in central California and lived there until I was 4 years old. My parents worked in the orange and lemon orchards and packing sheds. We started coming to Washington state and ended up staying because there was work year round. I am an HR Manager for a large potato and tortilla chip maker and accepted a job that required relocation so that’s how I made it to the Oregon Trail. 2. What is your favorite season of the year? I used to love summers. Something about it being bright when you wake up and then staying outside until 9 pm because it’s still not too dark is magical. When I was diagnosed with an autoimmune system disease called systemic lupus, I found out that sunlight and even florescent lights can trigger a lupus flare up. It changed my life in so many ways but one of the nice things I discovered is that it’s an adventure to garden in the early morning hours before the sun really comes up or even in the evening. I’ve always been a little different  This just gave me a reason people could understand. 3. What have you learned about yourself recently? I learned that I am an introvert. I had heard the word before but it didn’t seem to fit who I was. Most people I know would call me an extrovert—the life of a party or someone who always gets a conversation going, even if the group involved are strangers. I can do that and on the outside appear to be an extrovert but the truth is that it takes a lot out of me and I need quiet time to think and relax. 4. Describe a happy memory from your childhood. We lived about an hour away from Grand Coulee Dam in Washington state. My father took us to see a laser show that was played against the dam’s running water every Fourth of July. It was a beautiful dark starry night and I felt like I was in a dream. The dam is massive and the roar of the water makes it seem like it’s alive. 5. What is the best book you’ve read recently? These is my words by Nancy Turner. It’s got stuff about settlers going out west, love, tragedy, humor— all the things I love! I’m kind of a big nerd. When we lived in Washington state, we lived in an area that got a lot of snow. We didn’t have money for cool moon boots or even good shoes. We did have store bags. We would wrap plastic grocery store bags around our shoes so our feet and socks would get wet on the way to school. I would always walk in the deepest pockets of snow and try to get the other kids walking with us to pretend we were Lewis & Clark exploring the Oregon Trail. It should go without saying but yes….I was that girl! 6. If someone were to make a movie of your life, what actress would you want to play you? What genre would best characterize your movie? (Of course it’s a repeat favorite question). Penelope Cruz would be such an honor! I love her. I’m going to add sparkly vampires, time travel, John Oliver, people in capes, at least one zegraffe (cross between zebra/giraffe), The Bukis and The Tigres Del Norte and such to make up a totally new genre. 7. If you could live in another time, what time would that be? I’m good with the time I’m living in now. There have been a few really amazing days that make me want to invent a Groundhog Day Remote control so I could go back to them whenever I want. 8. If you could be an animal, what animal would that be and why? Tina the Llama from Napoleon Dynamite. Why? Because she’s Tina the Llama from Napoleon Dynamite. 9. Why did you decide to start blogging? I thought I wanted to publish a book. I was so self-conscience and still am a little. I like telling stories but I hate trying to figure out where the commas, and all those other annoying punctuations go. I have systemic lupus and my son has autism. I have found that there isn’t always information from the individual or family that has special needs or serious medical condition. When I first received both of the diagnosis I wanted to hear and see what this looked like and how it impacted other families. I found some books at the library but not what I needed. I also like to make people laugh and smile. I hope my blog makes people do those things! I want people to see that anything is possible. 10. Where do you find inspiration for what you write? 11. What is your blog theme (or more than one), stories, photography, books or poems? Why did you choose that blog title? My blog is called 4utu (For you too) and my tag line has been: It’s Your Life. Drive! I want people to see their individual power and not be afraid to assert themselves and fight for what they want. I have a few themes: Lupus & Me, Autism Tales and ongoing stories about some pesky cats— the ringleader’s name is Super Fluffles as he insists we call him. Estela, thank you so much for accepting the Liebster Blog Award and for sending me the answers to the questions. Your answers are great and now I know a lot more about you. In your writing there is always seriousness and a nice balance of humor. I love reading you blog posts. There is strength and power in your writing, and a good attitude toward life. It’s refreshing!